The law firm of Goede, Adamczyk & DeBoest, PLLC is proud to announce that Florida State Representative Heather Fitzenhagen, a Partner at the law firm Goede, Adamczyk & DeBoest, PLLC and a member of the Lee County Bar Association, will be the keynote speaker at the Lee County Bar Association’s August Membership Luncheon. The luncheon will take place on Friday, August 23, 2013 from 11:45 a.m. – 1:00 p.m. at the Sidney & Berne Davis Art Center, located at 2301 First Street in Fort Myers, and is open to the public. Fitzenhagen will present a “Legislative Update” and discuss topics including funding, education, business climate, and new bills that have been passed. The event is sponsored by the law firm of Goede, Adamczyk & DeBoest, PLLC, CopyLady, The Law Office of Kelly Fayer, P.A., and CONRIC PR & Marketing | Publishing. The cost to attend the luncheon is $20 for members of the Lee County Bar Association and $25 for non-members. Reservation and payment information can be found on http://www.leebar.org. Heather Fitzenhagen is an experienced attorney, mediator, business owner, corporate manager, philanthropist, and community leader. She earned a B.A. from Hollins University in Virginia and a J.D. from Nova Southeastern University Law School. She is also a graduate of the Harvard Mediation Program. In 2012, she became the first State House of Representative Elect for District 78 in Lee County. Fitzenhagen is very active in the Fort Myers community. 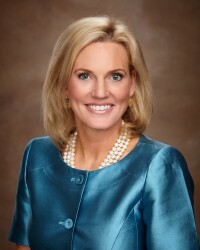 She serves on the Founding Board of the Betty Allen Ovarian Cancer Foundation and on the Executive Leadership team of the American Heart Association. She is also a board member of the Fort Myers Women’s Club, Lee County Association of Women Lawyers, and PACE Center for Girls – Lee. Attorneys John C. Goede, Mark E. Adamczyk and Richard D. DeBoest, II combined their experience and knowledge to create the law firm of Goede, Adamczyk & DeBoest, PLLC in January 2013. The firm provides expanded legal services for the growing number of community associations they represent throughout the State of Florida. The firm represents and counsels clients throughout South Florida including Miami-Dade, Lee, Collier, Charlotte, Hendry, and Glades Counties. Goede, Adamczyk & DeBoest, PLLC proudly operates from three office locations: 8950 Fontana Del Sol Way, Suite 100 in Naples, 2030 McGregor Boulevard in Fort Myers and Westside Plaza III at 8200 Northwest 33rd Street, Suite 303 in Miami. For more information, call toll-free 855-331-5100 or visit http://www.gad-law.com.